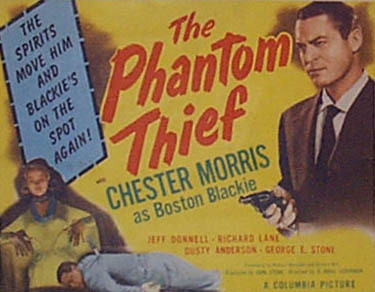 This is the eleventh movie in the Boston Blackie series. 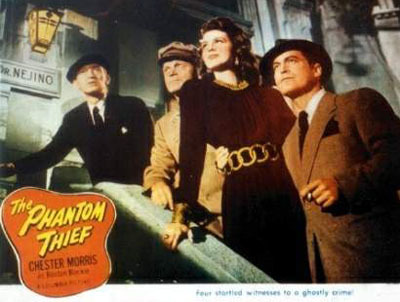 Murder, stolen jewels, sinister seances, ghostly apparitions and Blackie trying to stop a murderous blackmailer. Cinematographer: George B. Meehan Jr.
Boston Blackie indulges in some wit-trading with a squirmy spiritualist who deals in blackmail, murder and the occult. 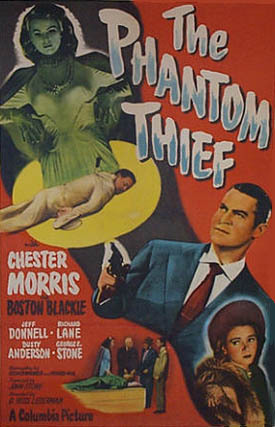 Blackie helps his pal, the Runt, recover some jewels, finds himself involved in the homicides, and also finds himself as the prime suspect, and now has to find the real culprit in order to clear himself. So Blackie, a man of many talents and already a proved magician, shows he knows a little bit about dancing skeletons, walking phantoms and spiritualism himself, and holds a seance to unmask the murderer. When reformed thief Boston Blackie tries to help a friend of his associate, The Runt, he finds himself enmeshed in a web of deception. Runt's friend, Eddie Alexander, chauffeur to Anne and Rex Duncan, had been asked by Anne to pick up a leather case from Dr. Nejino, a spiritualist. Upon opening the box, Eddie found a diamond necklace, and fearing that it was stolen, he turned to Blackie for help. Blackie takes the box from Eddie and proceeds to Nejino's office to question the doctor about Anne. Claiming that Anne is unstable, Nejino invites Blackie, Runt and Eddie to attend a seance that he is about to hold for Anne. Before strapping himself to a table to summon the spirits, Nejino instructs his secretary, Sandra, to phone Inspector Farraday of the police department. In a trance, Nejino intones that the ghost of Anne's father wants to speak to her, but an evil presence is preventing communication. Agitated, Anne screams, and when the lights are switched on, Eddie's body lies lifeless on the floor, stabbed in the back. Soon after, Farraday arrives and Sandra accuses Eddie of stealing the necklace. 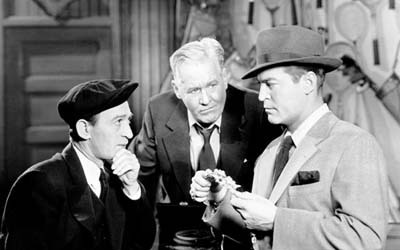 Farraday, Blackie's nemesis, is about to accuse Blackie and Runt of the crime when the two flee through a secret tunnel and take refuge in Anne's car. When Anne drives off and finds them hiding in her back seat, she asks for help. Anne confides that Nejino had been blackmailing her because, as a girl of seventeen, she had married the spiritualist. Her father had the marriage annulled, after which she married Rex, the scion of a wealthy Charleston family. One day, Nejino informed Anne that their marriage was never annulled, and to prevent embarrassment to Rex's family, she gave him her necklace to remain silent. After promising to help Anne, Blackie and Runt sneak back into Nejino's office and are greeted by the spiritualist, who demands the necklace at gunpoint. Aided by Sandra, Blackie and Runt escape and later meet Sandra at a restaurant. There Sandra discloses that her boss has become entangled in something evil and tells them about a confidential file that Nejino had hidden in the laboratory of his next-door neighbor, Dr. Purcell Nash. When Blackie and Runt hurry to Nash's laboratory, Sandra signals Nejino to call the police. Just as Blackie and Runt discover Nash's dead body, Farraday, summoned by Nejino, arrives. After narrowly escaping the police once again, Blackie and Runt split up and arrange to meet at Jumbo Madigan's pawn shop the following evening. The next night, when Blackie shows Jumbo the necklace, the pawnbroker recognizes it as belonging to Anne and reveals that Rex was penniless until he married Anne. Now suspicious of Rex's story about his wealthy family, Blackie phones Anne and asks her to meet him at the pawnshop. Having eavesdropped on the conversation, Rex follows her there. As Blackie tells Anne that Nejino and Rex are in league to swindle her, Rex aims his gun through the window and shoots Anne. 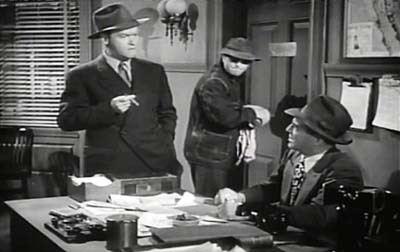 Blackie instructs Runt to surrender to the police and then disappears. Anne is taken to the hospital, and as Rex nervously paces the hallway, he is informed that his wife has died. Hiding in a doorway, Blackie observes Rex's reaction and follows him to Nejino's. Soon after, Farraday and Sgt. Matthews arrive at Nejino's, and Farraday asks the spiritualist to contact Anne so that she can reveal the name of her killer. After Farraday leaves to bring Runt to the seance, Blackie enters Nejino's office and knocks him unconscious. As Farraday, Matthews, Runt, Sandra and Rex gather for the seance, Nejino is wheeled into the room, strapped to the table in a trance. When he summons Anne's spirit, her image appears in a mist and accuses Rex of deception and murder. Pulling out his gun, Rex fires at Anne's image, then shoots Nejino after accusing him of a double-cross. At that moment, Anne appears, very much alive, and Blackie reveals that on the day of Eddie's murder, a dummy of Nejino had been strapped to the table while the real spiritualist slipped through a hidden door, allowing him to kill Eddie. Blackie continues that he and Farraday were secretly working together to trick Rex and Nejino into exposing their racket.